This Pumpkin Pasta with Sausage and Apples has all of your favorite seasonal flavors in one dish. Sausage, apples and onions stud a rich pumpkin cream sauce flecked with cinnamon and nutmeg. This mountain of deliciousness is then topped with a blizzard of Parmesan cheese, parsley and additional apple for a picture perfect presentation. It’s October which means everyone seems to be in full on pumpkin mode. Pumpkin Chocolate Chip Muffins, Upside Down Pumpkin Pie, Black Bottom No Bake Pumpkin Cheesecake. Are you sensing a trend here? Most people think that pumpkin must be used only for sweets. But, alas! Not so fast! As much as you love pumpkin in dessert, you’ll love it just as much in my main dish Pumpkin Pasta with Sausage and Apples. The inspiration for this recipe began with my monthly series with Melissa at Lulu the Baker. Each month we use the same three ingredients to create a recipe and then share them on the same day. This month, Melissa was in charge of selecting ingredients and chose pumpkin, apples and spices. Of course my thoughts immediately thought of all things sweet. Pancakes? French toast? Bread? And then I recalled a pasta I had made several years ago – as in pre-children several years ago – that had used pumpkin. The original recipe was just okay, but it was a great jumping off point for my new and improved recipe. Be sure to checkout these Mini Pumpkin Scones with Apple Cider Glaze that Melissa made with this month’s ingredients. 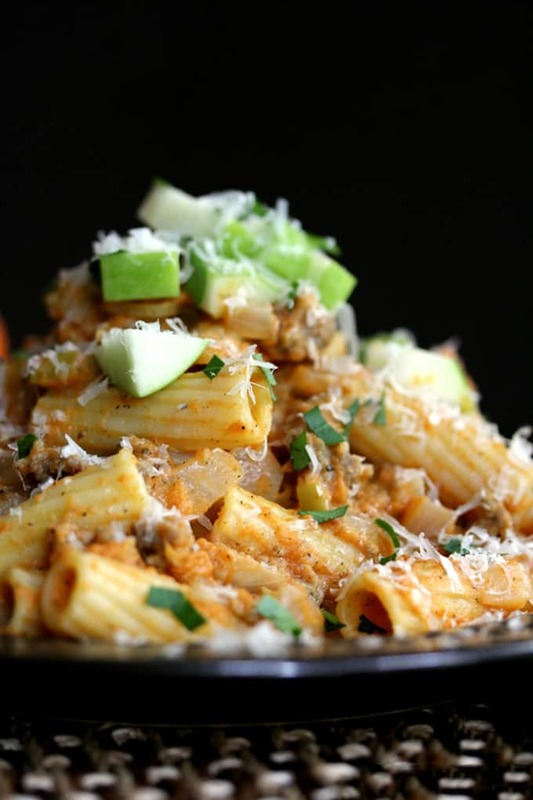 My favorite pasta – rigatoni for the win! – is bathed in a sauce that screams autumn harvest. Sausage, apples and onions stud a rich pumpkin cream sauce flecked with cinnamon and nutmeg. This mountain of deliciousness is then topped with a blizzard of Parmesan cheese and I chose to take it a step further with chopped parsley and additional chopped apple. 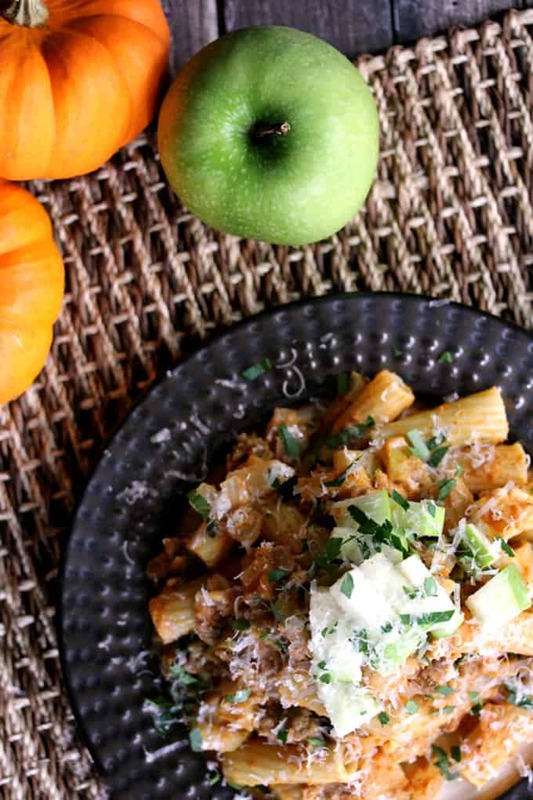 I’m telling you friends, this savory Pumpkin Pasta with Sausage and Apples is where it’s at! 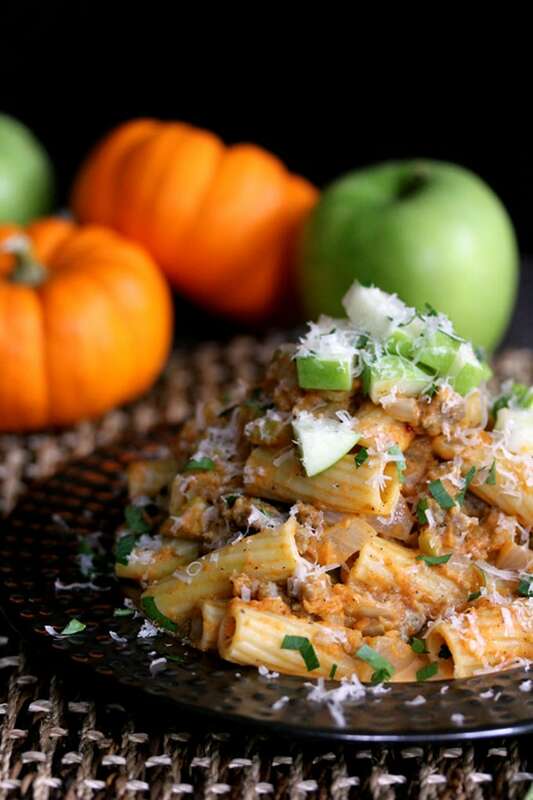 Besides being insanely delicious, I also love that this Pumpkin Pasta with Sausage and Apples recipe feeds a crowd. Perfect for our growing family and it also leaves a bit leftover for mama to enjoy for lunch the next day. And I’m totally fine with that. Looking for even more savory pumpkin recipes? I don’t blame you! I recommend you start with my Pumpkin Cream Cheese Skillet Cornbread. It would be an amazing accompaniment to this Savory Pumpkin Beer Chili. I also love the looks of this Chicken Bacon Pumpkin Gnocchi and these super easy Pumpkin and Fried Sage Flatbread. In a large skillet over medium heat, brown sausage. Remove to paper towel lined plate to drain. Add onion, apple and garlic to pan and cook until softened. Add white wine, bay leaf and sage to pan. Cook for two minutes to allow wine to reduce. Stir in chicken broth and pumpkin puree and bring to a simmer. Return sausage to pan and stir in whipping cream, cinnamon, nutmeg, salt and pepper. Stir prepared pasta into pan and allow to warm through before serving. Garnish with grated Parmesan cheese as well as chopped parsley and additional chopped apple, if desired. I made this tonight! I couldn't find ground sausage so I just used sausage links and cut them into bite sized pieces. It's pretty good - not as strong a pumpkin flavor. So glad you enjoyed it, Natalie! Thanks so much for taking the time to let me know - so appreciate it! I made this for my pumpkin blog and liked it a lot. Thanks! So glad you enjoyed it, Betsy! Thanks so much for taking the time to let me know! Made this for dinner tonight, exactly as written, and it was amazing! So happy you enjoyed it, Tricia! Thanks so much for taking the time to let me know! Dear Melanie, what a unique and beautiful autumn dish. Love the idea of pumpkin pasta in the fall. Pairs perfectly with the apples and sausage. Can't wait to try this! You're so sweet, Allie - thank you! wow! Made this last night and it was totally gourmet. Suprisingly, did not have an overwhelming pumpkin flavour. Used half the amount of cream and used a little beer with the wine (didn't have enough wine) A fall, comfort meal for sure! Lynn, you totally made my day with your kind words - thank you! I can't say I've ever tried putting apples in pasta before, but I was actually just wondering about the possibility earlier this week! This looks fantastic - a quintessentially autumnal pasta dish. Yum! Thanks so much for the kind words! Let me know if you give this a try! Yumm, pumpkin cream sauce? This sounds perfect! It is pretty delicious, Karishma! 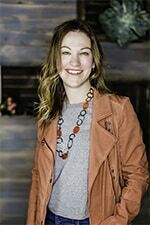 Thanks so much, Melissa - always love that when it's your turn to pick ingredients, it pushes me to try something out my norm! I love that you added apples to pasta, what a great idea! 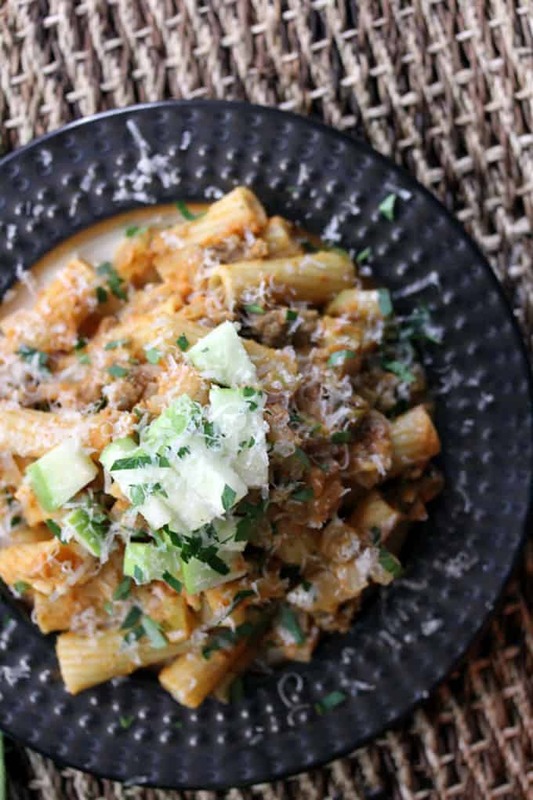 This pasta looks phenomenal, and I love all the parmesan piled on top! Thanks, Stacey! I think it's an unwritten rule that all pasta be showered with Parmesan! Would love to hear what you think if you were able to give this recipe a try, Becky! Melanie, I LOVE how you picked a savory action with pumpkin! Also, loving the "blizzard of Parmesan"... so delish! You're so kind, Gloria - thank you! What a great idea to put apples, pumpkin and sausage together in a pasta. I must try this! Thank you so much, Kate - so appreciate it!